Terry Austin here with a brief review of my brand new Matias keyboard. 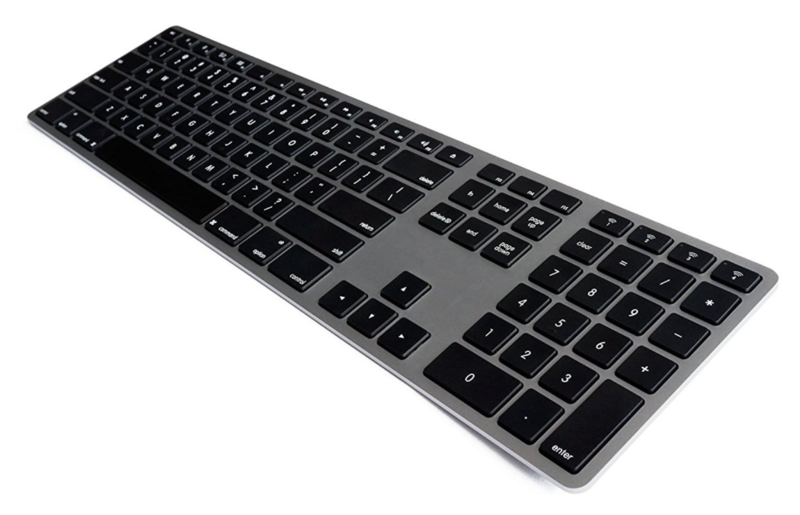 I recently found myself in need of a new wireless keyboard and on the very reliable recommendation of the ineffable Jeff Gamet over at the Mac Observer, I went with the Matias Wireless Aluminum Keyboard in Space Gray (to match my MacBook Pro). 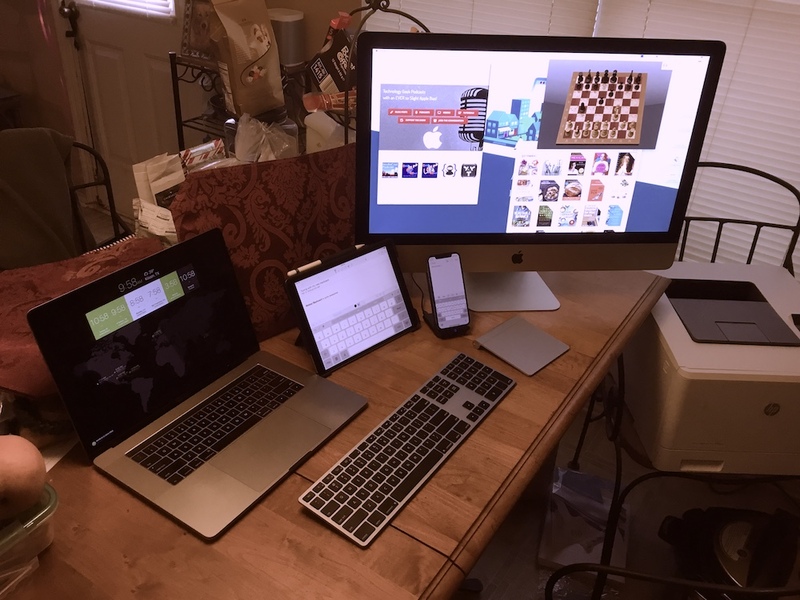 I have a 2017 MacBook Pro, a 4K 27” iMac, an iPad Pro, and an iPhone X… At various times of the day, I need to type on each of those devices and that’s where the Matias Wireless Aluminum Keyboard really shines. First, let’s discuss setup… Charge the battery! I plugged it in to microUSB and charged overnight, I believe it recommended a 5 hour charge, but for me overnight was easy since it arrived late in the afternoon on my doorstep. Why such a long charge, you might ask? This thing has a generous 1600mAh lithium ion polymer battery. The company’s website touts a range of 533 to 1,600 hours of typing between charges (varies depending on typing speed, indicator lights used, etc). In short, with any luck you may get a full year between charges. And… in fact, that’s exactly the experience reported from Jeff Gamet before I purchased mine. As the name would indicate, the top case is a gorgeous space gray that nicely compliments my MacBook Pro. There is, of course a full set of alphanumeric keys. There are Mac-Friendly function keys to handle screen brightness, volume, disk ejection. You can also toggle back to standard “function key” with the fn key if needed. They’re numbered 1, 2, 3, and 4 and they have a little wireless symbol above each digit. These dedicated 1-2-3-4 keys are for pairing with up to four separate Bluetooth devices. Press & hold any of the four buttons until they begin flashing blue to put the keyboard in pairing mode. In order to switch to any device, you simply tap the key that corresponds. I’ve included a link for the show notes to the keyboard over on Amazon – using, of course, Allison’s affiliate code. I’m also including a picture of my workspace. I included that to point out a handy setup suggestion. As you can see in the image, my devices are laid out in their usual fashion from right to left on my work bench… MacBook Pro, then iPad Pro, followed by iPhone X on a nice charging stand from Anker), and the iMac. The keys to toggle devices are in that order as well, so all I have to do is look from right to left, decide I want the iPad Pro to type on for these show notes and tap the dedicated “wireless-2” key to select the iPad and then start typing away. Key travel is a satisfyingly deep touch with a firm feel, not at all mushy or clicky. I actually prefer this feel to the keyboard on my 2017 Touchbar MacBook Pro. Oh… there is a power switch on the front edge of the keyboard but on Jeff’s suggestion, after the initial setup I pretty much ignore that switch. The keyboard powers itself down after a few minutes of quiet time, and powers back up whenever I start typing again. This is easily my new favorite keyboard and if you’re looking for one you might consider giving it a try. An aside… Matias recently released a backlit version of this same keyboard that you might be interested in. I would presume it has pretty much exactly these same features (it looks identical in the photos). That one is a bit pricier, coming in at $159.99 over on Amazon. Looks like for now the backlit version is only available in Siver or Space Gray but other colors may be available. I’ll include the link in the show notes for the backlit version as well in case that’s more to your liking but I haven’t handled that one yet and likely won’t be doing so any time soon. Now with that review done, I believe that Allison mentioned a very special connection to this keyboard that she thought was pretty cool… I’ll leave it to her to tell you about that. Hope this has been helpful… See you all online, and STAY SUBSCRIBED!